An inventory control manager is a professional person who takes hold of the complete inventory of the firm to make it adequate in accordance with the needs and requirements of the company. They are also assigned a difficult task of implementing the procedures that can manage the inventory of the firm effectively. When you get a job offer that you cannot refuse, the only option you have in such a situation is to write a resignation letter to leave the current job. Before you write a resignation letter, try to get the offer letter first. You should also be interviewed for the next job, before submitting the official resignation to your boss. The letter should clearly state the leaving date of the employee. The notice of the left should be given according to the contract signed by the employee. So, before writing the resignation letter, the terms and conditions of the contract should be read carefully. The tone of the employee should be polite and respectful no matter you are happy with your boss or unhappy. You never know when you will again need your ex-employer for getting the job referral or for any other reason. 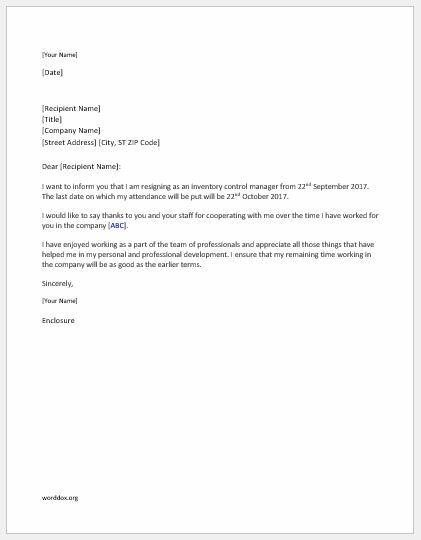 Here is a sample inventory control manager resignation for those people who wish to write a perfect resignation letter. I want to inform you that I am resigning as an inventory control manager from 22nd September 2017. The last date on which my attendance will be put will be 22nd October 2017. I would like to say thanks to you and your staff for cooperating with me over the time I have worked for you in the company [ABC]. I have enjoyed working as a part of the team of professionals and appreciate all those things that have helped me in my personal and professional development. I ensure that my remaining time working in the company will be as good as the earlier terms.